SAN FRANCISCO—Amazon.com Inc. picked America’s financial and political capitals for its split new headquarters, saying on Nov. 13 it will build offices for more than 25,000 people each in New York City and close by Washington, D.C. The world’s largest online retailer plans to spend $5 billion on the two new developments and expects to get more than $2 billion in tax credits and incentives, with plans to apply for more. Its move ends a frenzied year-long bidding war among cities across North America, splitting the location between two finalists. In addition, Nashville, Tennessee, will become Amazon’s fourth-biggest office outside Seattle with more than 5,000 corporate jobs focused on technology and management for its retail operations unit. With more than 610,000 workers worldwide, Seattle-based Amazon is already one of the biggest employers in the United States and the world’s third-most valuable company, behind Apple Inc. and Microsoft Corp. Still, it faces fierce competition for talent with Alphabet Inc.’s Google and other companies offering free perks in sunny—but increasingly unaffordable—Silicon Valley. It hopes the new headquarters will give it a leg up when it starts hiring for the offices in 2019. “These two locations will allow us to attract world-class talent,” Jeff Bezos, the company’s chief executive and world’s richest man, said in a news release. Already marketing its forthcoming New York location in Long Island City, just across the East River from Midtown Manhattan, Amazon said the neighborhood is home to breweries, waterfront parks, and easy transit access. In addition, the choice of Arlington, Virginia, could hand Amazon greater political influence in the nearby U.S. capital, where it already has one of the largest lobbying shops in town. 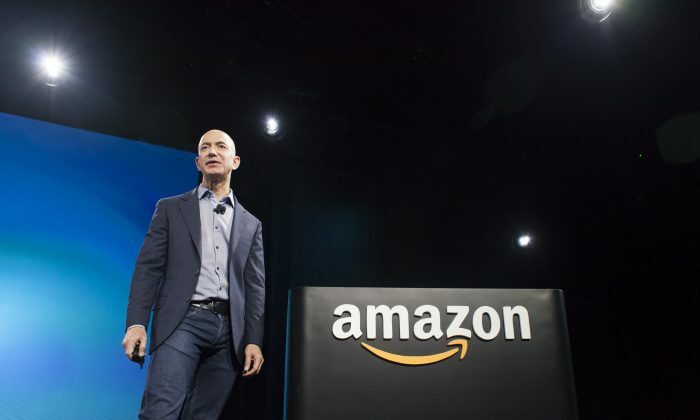 Bezos privately owns the Washington Post, which has written critical articles about President Donald Trump and, in turn, he has been a frequent target of broadsides from the president. The paper maintains full editorial independence from its owner. At the outset of the headquarters search last year, Amazon said it was looking for a business-friendly environment, in addition, to help recruiting workers. The company said on Nov. 13 it will receive performance-based direct incentives of $1.525 billion from the state of New York, primarily for creating 25,000 jobs with an equivalent benefit of $48,000 per person. It also can apply for credits worth $3,000 per job under the city’s Relocation and Employment Assistance Program. In Virginia, it will receive performance-based direct incentives of $573 million, based on 25,000 jobs at $22,000 in benefits per head. In sum, Amazon will get a boost worth greater than $2 billion for the new offices, on top of $1.6 billion in subsidies it has received from across the United States since 2000, according to a database from the Washington-based government watchdog Good Jobs First. The new offices will generate more than $14 billion in extra tax revenue for New York, Virginia, and Tennessee over the next two decades, Amazon said. “This is a giant step on our path to building an economy in New York City that leaves no one behind,” New York City Mayor Bill de Blasio said in the press release. The company expects an average wage of more than $150,000 for employees in each new office. In evaluating its options, Amazon drilled down into the quality of schools to which employees could send their children, a key factor in keeping workers satisfied. The company evaluated local SAT scores for college admission and met with superintendents, hearing how they characterized the importance of education in science and math. It was not immediately clear how negotiations unfolded once Amazon settled on the plan for two offices, which Reuters and other media reported last week. The company has said it helped boost Seattle’s economy indirectly by $38 billion between 2010 and 2016. Construction and service work has increased, catering to Amazon, and the company said it also helped attract other businesses to Seattle. Amazon shares were up about 1 percent in morning trade.